I have always been a philosophical fan of David Hume. His clear writing, commonsense approach to things, rejection of abstruse philosophizing, embracing of science, and constructive skepticism have been the sort of traits I have aspired to, however imperfectly (no, I assure you this ain’t false modesty), throughout my career. Hume’s idea that a wise person proportions beliefs to evidence, later popularized (and somewhat distorted) by Carl Sagan in the motto “extraordinary claims require extraordinary evidence” has guided me for many years, hopefully leading me to make as sound judgments as possible, as well as to change them when the cumulative evidence requires it. Add to this that le bonne David, as he was known in the Parisian salons of the Enlightenment, had a generally mild and pleasant character, and you get the features of an intellectual role model. 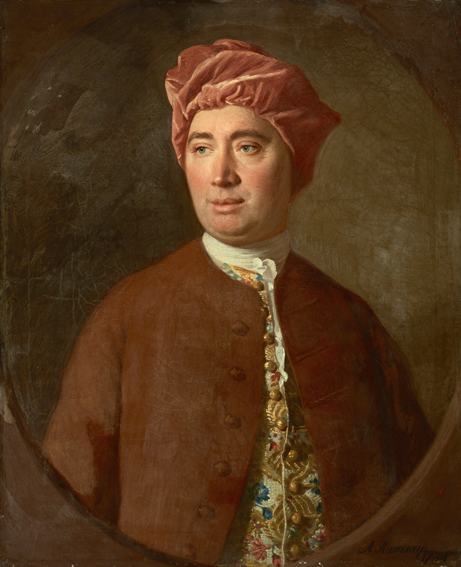 A Stoic, however, David Hume certainly wasn’t. Or was he? A recent article by Matthew Walker in the British Journal for the History of Philosophy (2013) tackles the question in an interesting way. Walker focuses on four essays in which Hume explores the nature of “the true philosopher,” simply entitled “The Epicurean,” “The Stoic,” “The Platonist,” and “The Sceptic.” Hume, who does not write in his own voice, but attempts an analysis of each school by writing as if he were a member (just like Cicero had done in his De Finibus, which Hume used as a model for his own essays), seems far more sympathetic to the Stoics and the Skeptics then to the Epicureans and the Platonists. Walker, then, explores an apparent contradiction in the way Hume talks about Stoicism and Skepticism: on the one hand, he accepts the Stoic tenet that there is a way of life that the true philosopher attempts to follow, and that it is the best life possible. On the other hand, however, he also agrees with the Skeptics that there is no single way of achieving happiness. What gives? The answer, Walker suggests, lies in Hume’s flexible concept of how a true philosopher should live. Let’s begin with Hume’s presentation of the Stoic point of view. It hinges on three theses: i) virtue-eudaimonism, the idea that virtue is the primary contributor to the happy life; ii) the reflection thesis, whereby the true philosopher guides his actions by reflection, the same way he develops and maintains his character; and iii) the supremacy thesis, the proposition that this is the best life for a human being. Walker provides a nice analysis of Hume’s commitment to virtue-eudaimonism — the first of the three Stoic theses — albeit in a qualified fashion. He does think that the “sole purpose [of virtue] is, to make her votaries and all mankind … cheerful and happy,” but then distinguishes different virtues according to their specific contributions. So we have virtues that are immediately “agreeable” to oneself (cheerfulness and pride), those that free us from harmful behaviors (discretion, industry and frugality), virtues that are immediately good for others (wit), and those that are good for others in the long run (humanity, generosity, beneficence). Interestingly, Hume’s take come close to that of a minority opinion within ancient Stoicism, as expressed for instance by Panaetius, of whose thought Hume was aware. Hume is also committed to the reflection thesis, the second one advanced by the Stoics. Here he takes a cue from a famous phrase by the poet Ovid: “A faithful study of the liberal arts humanizes character and permits it not to be cruel,” meaning that learning and reflection do make crucial contributions to a worthwhile human life. For Hume, philosophical reflection can help both negatively, by “extinguishing” violent passions, and positively, by improving our sensitivity to agreeable passions. Importantly, Hume doesn’t think that simply thinking about stuff improves our character and conduct, but he maintains that rational reflection can be used to change behavior and that, through repetition and habituation, one eventually can alter his character and disposition for the best. Needless to say, this is very similar to the Stoic doctrine of the gradual development and practice of virtue. What about the supremacy thesis? That’s where things get interesting. Hume’s Skeptic answers the Stoic by saying that only a philosopher could be so blind as to think that the life of reflection is the only path to happiness. Plenty of people are happy by pursuing different lives, resulting in a type of pluralism that appears incompatible with the supremacy thesis. Moreover, Hume agrees with the Skeptic that the powers of philosophical reflection are limited, and so is their efficacy on strong passions like anger and ambition. Hume attempts at synthesizing the two schools (just like Cicero’s before him), beginning with the contention that the Skeptic “carries the matter too far” in his criticism of philosophical reflection. Sure, one’s anger doesn’t go away because of one’s philosophizing, but critical reflection makes us see that anger is a destructive passion, therefore inducing us to take steps to curtail it, if not extinguish it. The Skeptic is right in thinking that reflection by itself cannot instill virtue, but the ancient Stoics did not think this either, hence their above mentioned developmental psychological account of virtue, from children before the age of reason to mature adults. Also, Hume again agrees with the Skeptic that Stoicism can be used to conceal cold-heartedness and self-absorption, but counters that in effect those would be cases of bad Stoicism, as the philosophy itself only counsels a reasonable detachment from externalities, nothing more. Stoics, in other words, do not attempt to extirpate passions, but to moderate and redirect them. The core of Walker’s argument, however, is that Hume reconciles Stoic and Skeptic positions, rescuing the supremacy thesis, by suggesting that there are two types of “philosophical” lives: narrow and broad. Walker’s analogy with religion here is brilliant and very helpful: we have no trouble understanding that religion can guide, and be central to, the lives of people. But we don’t translate that into the absurd idea that everyone should be a monk. Rather, we recognize a religious life narrowly defined, which is attractive to a few people, who achieve a meaningful existence through contemplation, prayer and the study of scriptures. But we also recognize a broadly defined religious life, which is practicable by most people, which still provides meaning and requires certain practices and studies, but that is also compatible with a number of other, non-religious aspects of existence. This is the case across religious traditions, from Christianity to Buddhism. The Stoic position, then, becomes untenable for Hume if they meant that only the narrow philosophical life is conducive to happiness. But they clearly did not. Just like there were Stoics who did live that life — Zeno, Chrysippus, Musonius Rufus, Epictetus — there were others who lived a Stoic life in the broad sense, including Cato and Marcus Aurelius. This entry was posted in Other philosophies, Virtue Ethics on April 22, 2016 by Massimo. We can do much worse than to cultivate people who are both skeptical and virtuous. This takes us down a good direction. Your paragraph beginning, “The core of Walker’s argument, however, is that Hume reconciles Stoic and Skeptic positions…”, IMO, is the most important paragraph in this post. In my own study of history, I sense that I’m stumbling on cases of this and that they have boded badly for Stoicism as a movement. It isn’t as simple as the stereotypical English “stiff upper lip” either. Stoicism in times past and maybe in times present has perhaps lacked a policing mechanism that could serve to prevent the excesses of the inevitability of attracting people whose motives turn for the narcissistic and whose capacities should probably be contained to their own person. Enjoyed this, while noting the “No True Scotsman” (yes, a pun) argument that you/Hume/Walker work your way around deftly. Thanks. Massimo, shortly after reading your explication of Walker’s piece, I came across this article, which I cite because of your interest in Hume. James Harris’ recent _Hume: An Intellectual Biography_ spends quite a bit of time on Hume’s own Stoic experiment, under the influence of then modern Stoics such as Shaftesbury and Hutcheson. It seems to have led Hume to a mental and emotional breakdown for a while. Harris support the notion that while he had great respect for the Stoics, Hume ultimately abandoned them more than Walker argues. If nothing else, the Stoic emphasis on reason was very different from Hume’s conception of reason as a sort of handmaiden to the passions. Regardless, if you’re looking for more on Hume and the Stoics, Harris is a good read. Dear Massimo, I love this piece, and thanks for sharing these insights into my dearly loved Hume! May I republish this at my blog Ordinary Philosophy, with a link back to your blog here and your bio? Amy, thanks for the kind words, and yes, by all means, republish the post! This, then, relates to whether one thinks Hume more of an Academic or more of a Pyrrhonist. In his skeptical fervor, one could call him more the latter, but in his bon mot of “just going to bed at night,” one could call him more an Academic. Thomas (and others): Per the Hume link, I have a friend on Facebook who did part of his Ph.D. study at St. Andrews under Harris. He says the book is very much the real deal (and my friend Brent is not a Humean). For sure. But I never followed Hume that far, seems to me that his more moderate take, as presented in Walker’s essay, is far more reasonable and reflective of the reality of the human condition. At any rate, of course Walker isn’t suggesting that Hume was a Stoic, only that he was more sympathetic to Stoicism than one might think.